With a top speed of over 100 mph the First Pitch 2 Wheel Curveball Pitching Machine features all of the power and precision you must have for batting practice against curveballs as well as other major league pitches: Curveballs, Sliders, Knuckleballs,Fastballs, Tailing Fastballs and Even Sidearm Curves. All these pitches are created simply by adjusting each wheel to different speeds. 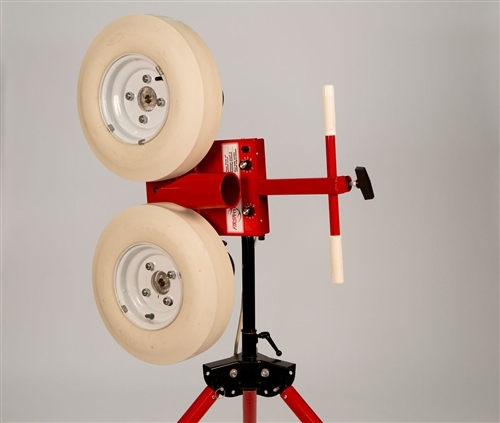 A unique swivel function and a side to side adjustment allows for positioning the tires to throw different pitches at different angles.